Tokyo 2020: "Hugely impressed" or lost in translation? TOKYO -- There is no question, absolutely none, that Tokyo could put on the Summer Games in 2020. They have the technical know-how. They proved that here, again, this week. They're certain to get a good write-up when the International Olympic Committee's Evaluation Commission releases its formal report, in July. "We have been hugely impressed by the quality of the bid preparations," the head of the commission, Britain's Sir Craig Reedie, told a jam-packed news conference Thursday, adding a moment later, "Across the board, it has been excellent in every way." As always in Olympic bidding, for all the complexities, there are -- to paraphrase Sebastian Coe, who championed London's 2005 winning campaign and then served as London 2012 chairman -- only two questions, how and why. Having manifestly established the how, the challenge now facing Tokyo before the IOC vote Sept. 7 -- Madrid and Istanbul are also in the 2020 race -- is the why. Can Tokyo craft a compelling story? History shows they know what to do when they get big events in Japan. The 1998 Nagano Winter Games? The 2002 soccer World Cup, shared with Korea? The 2007 Osaka track and field world championships? And yet recent years have also seen a profound disconnect in Japanese bids for the Olympics. In 2001, Osaka's bid for the 2008 Summer Games got six votes out of 112, out in the first round. In 2009, Tokyo's bid for 2016 -- which scored high in the evaluation report -- had to scrimp for votes to get out of the first round, just to save face. That helped knock Chicago, which got a mere 18 votes in Round One, out. Tokyo then promptly went out in Round Two, with just 20. They decided after the 2011 earthquake and tsunami that ravaged northeastern Japan to bid for 2020. Next week will mark the two-year anniversary of the disaster. "Tokyo does not face a big issue of radiation -- that was explained," Tsunekazu Takeda, president of Tokyo 2020 and the Japanese Olympic Committee as well as the lone IOC member in Japan, said. And saying that the water in Tokyo is clean enough to drink from the tap, which they made a point of doing to the evaluation commission -- that's not a story. That's just normal. At a gala dinner Wednesday evening, Prime Minister Shinzo Abe started his remarks to the commission by saying, "Japan is an aging society; that's why we hope Tokyo will be chosen." With all due respect to the prime minister, the IOC is relentlessly seeking to appeal to a younger demographic. How does his observation help? Thursday's wrap-up Tokyo 2020 news conference showcased bid officials and athletes, eight personalities in all. On stage, among others: Takeda; Masato Mizuno, the Tokyo 2020 chief executive and a JOC vice president; and Tokyo Gov. Naoki Inose. There is a tendency here for sartorial conformity, the bid uniform a blue suit and white shirt. That monochromatic vision calls to mind the image the Pyeongchang bid team put forward in 2007 for 2014. Note: that bid did not win. It was only when Pyeongchang injected more verve and dash in its clothes and its presentations -- and, not incidentally, switched almost entirely to speaking English, which the IOC moves mostly in now -- that it rolled to a landslide victory in 2011 for 2018. Already some of the more sophisticated souls working on the Tokyo team have recognized the danger in the parallels to Pyeongchang's unsuccessful efforts -- because, too, the IOC would have to be convinced to come back to Asia in the summer of 2020 after being in Korea in the winter of 2018. There were blue shirts on stage Thursday, not just white. And grey suits, not just blue. And Gov. Inose started the conference by saying, "I have really enjoyed this week," and he spoke in English. To be plain, 2020 offers Tokyo a far better chance for victory than 2016. There are only three cities in this 2020 race, not four as in 2016. And there's only one -- Istanbul -- that, like Rio, offers the IOC the expansionist strategy that has dominated recent bid contests. Meanwhile, it's plain the issues around which the 2020 race will turn are, first, whether the IOC wants to keep heading toward new shores and, second, whether it wants another huge urban makeover construction project. Sochi, the 2014 Winter Games host, is already is known to cost more than $50 billion. Work is still not done. Rio de Janeiro, the 2016 Summer Games site, is so bedeviled by delays that the IOC has been saying, albeit in IOC code, to hurry up with a multiplicity of projects. Time "is of the essence," the Brazilians were told when an IOC team was there just last month. Istanbul's construction budget weighs in at $19.2 billion, and history has shown that figures provided in bid books tend to be understatements. Madrid has yet to make its case to the evaluation commission; that four-day visit begins March 18. Here, the venue plan calls for 28 of the 33 competition venues to be within five miles of the Olympic Village; the village would be built on reclaimed land in Tokyo Bay. Though they have a $4.9 billion infrastructure budget, 40 percent of which will be directed for a make-over of the national stadium, they also have plenty in the bank, the money just sitting there, the commission heard. Japan has a $5.9 trillion economy, the world's third-largest. Abe, moreover, has shown signs that he is willing to make market-opening changes that Japan has resisted for nearly 20 years. If Tokyo were itself a country, the commission was told, its economy alone would almost make the top 10 in the world. Even the Tokyo polling numbers are up: 70 percent of locals want the Games, an IOC survey disclosed. That's up from 47 percent last year. Reflecting on the four days with the evaluation commission, the governor, still speaking in English, said, "I believe we have shown the best of Tokyo. All those assets that will underpin the smooth delivery of Tokyo 2020 -- for example, our exceptional transport infrastructure, our cutting-edge technology and the very high levels of safety and security in Tokyo." That has the makings of a story: Tokyo as reliable, fun and interesting choice. Bring on the sushi. It just needs to be told, and votes asked for. Unclear -- given history, personality and temperament -- is whether it can be done. The governor, as he was wrapping up the news conference, suddenly found himself telling roughly 1,000 journalists about the work of the former Harvard professor and political scientist Samuel Huntington, who died in 2008, and Huntington's focus on the competing cultural identities in the world of perhaps seven or eight "civilizations." Japan, as the governor noted, is one. "Because of the maturity of this civilization, we will have a situation where we can 'discover tomorrow,' " Inose said, now in Japanese, slipping in the bid's catchphrase. "By 2020, we can show that to the world by hosting the Games." In Tokyo, the risk is that the story -- the why -- keeps getting lost in translation. They have six months to try to figure it out. 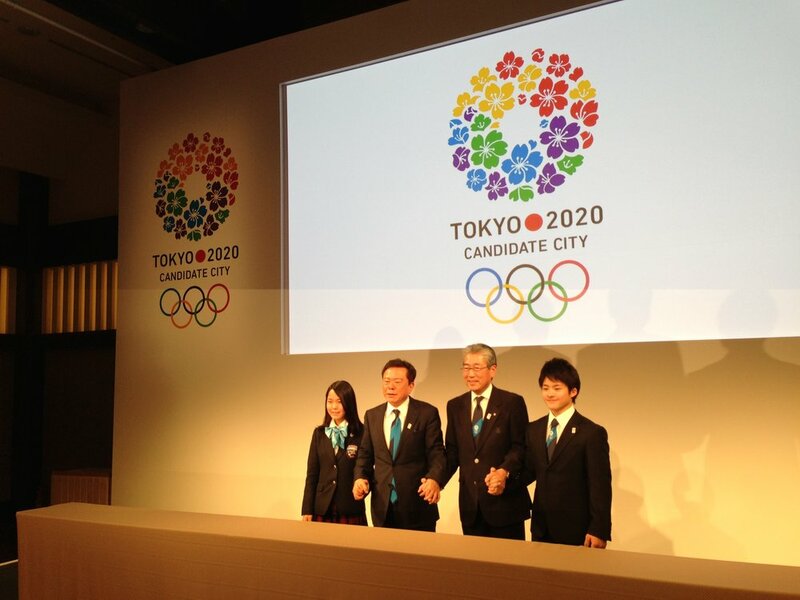 TOKYO -- Headline: IOC survey shows local support for Tokyo 2020 now 70 percent, up 23 percent from 47 last year. The International Olympic Committee gave Tokyo 2020's bid a boost Tuesday with the release of those survey figures. At 47 percent, which was what the IOC measured in what was called the "Working Group Report" last May, Tokyo might as well have not bothered; the IOC likes to feel welcomed. To be candid, 70 percent is still not rousing. But it's dramatic progress, indicative perhaps of the Japanese team's strong showing last summer at the London Games (38 medals overall). And it for sure puts Tokyo in the game; London's winning bid for 2012 only registered 68 percent support in London itself, according to the March, 2005, IOC evaluation report. Tokyo also bid for the 2016 Games, won by Rio de Janeiro. At this point in the 2016 race, the Tokyo poll numbers: 56 percent support in Tokyo, 55 percent nationally. Preliminary results for Madrid and Istanbul, the other two cities in the 2020 race, have not yet been made publicly available. The IOC will release the full results, methodology and timing in the Evaluation Commission's report, in July. It's little wonder Tsunekazu Takeda, president of both Tokyo 2020 and the Japanese Olympic Committee as well as the lone IOC member here, said at a Tuesday evening news conference, "We are very happy to hear those numbers." Real news -- like the release of such poll numbers -- is deliberately kept scarce in these commission visits. Instead, the process is -- to repeat, by design -- a melange of sights and scenes. The one question that everyone wants answered -- who is going to win? -- obviously is not susceptible to answer. No one can predict the IOC or the future. Instead, at least for public consumption, this is mostly theater. Behind the stage, the commission is actually doing real work. But in front of the curtain, it is all carefully stage-managed. Six months ahead of the vote, which in this instance will be in Buenos Aires in September, the IOC drops into town for four days, giving the particular city a chance to promote its bid -- big-time -- in town and nationally. Such promotion can prove a key momentum-builder in a campaign. What both sides, the bid city and IOC, want is a win-win. The bid city wants the local press to turn out in droves and to see the bid as serious and constructive. The IOC wants all bids to be seen as serious and constructive; that way, going forward, it encourages more bids from more cities, wherever they may be. That big blue tower is an incinerator. It is said it would thoughtfully be turned off during the Olympics. That blue mat-looking thing in the middle of the asphalt was a welcome sign for the members of the evaluation team. It was promptly stripped away as soon as they left. The white tent -- which you can see, just behind the blue, in the middle of the photo, glinting in the sun? It was put there to keep the members of the commission warm and it similarly was taken down, pronto. By the time reporters were driven by, literally just a few minutes later, the poles were on the ground. Next photo below: the proposed location of a whole bunch of venues, everything from volleyball to gymnastics to BMX cycling to wrestling (if wrestling makes its way back on the 2020 program, that is). Referring back again for a moment to the photo above of the proposed village, these venues would be located across the bridge that sits on the left of that picture; this is a main reason why the Tokyo venue plan is so compact. Notice how these sites are obviously surrounded by water. The views would be outstanding -- just imagine the fireworks on opening night, evocative perhaps of the scene in Sydney in 2000. At the same time: is it an issue that the way in and out would be by bridge or, say, water taxi? No one likes to think of the worst case imaginable but that's what planners plan for ... especially in the Olympic business. What if? Next: here is Tokyo Gov. Naoki Inose -- "I'm a Sunday tennis player, mind you'' -- rallying with London and Beijing Paralympic Games singles champ Shingo Kunieda for the benefit of the Evaluation Commission. The contrast between Inose and the prior governor, Shintaro Ishihara, has been pronounced. Ishihara controversially injected himself into a diplomatic feud with China over a group of disputed islands. Inose has struck a different tone, indeed, not just playing sports but talking about them and -- about harmony. His own triumph in the marathon (he ran it for the first time recently, in his mid-60s, after starting out by running just a few blocks around his house); the French literary theorist Roland Barthes, and Barthes' pioneering studies on semiotics, or signs and symbols; and the "sacred haven of nothingness" that is the imperial palace in central Tokyo, "at the very depth" of the Japanese spirit of hospitality, a green space surrounded by modernity, tranquility giving rise to all that is possible now. "It's one of the elements that should never be forgotten," he said. Also never to be forgotten is what it's like to travel in the pack that is the Japanese press. Here is the scene at the Tokyo Metropolitan Gymnasium Tuesday afternoon, just moments after the Evaluation Commission left, the pack interviewing table-tennis players Ai Fukuhara, 24, the team silver medalist in London, and Koki Niwa, 18, the 2010 Youth Games Singapore gold medalist who played in the London Games but did not medal. What would a U.S. ping-pong player give to be part of such a scene -- just once? Across the street from the Tokyo Metropolitan Gymnasium sits the National Stadium, site of so much at the 1964 Games -- for instance, U.S. distance standout Billy Mills' unexpected gold in the 10,000 meters. Above the facade to the stadium entry, chiseled into stone, are the names of all the gold medalists -- Mills, swimmer Don Schollander, boxer Joe Frazier, all the members of the U.S. basketball team (Bill Bradley, who would later become a U.S. senator from New Jersey, is memorialized as "W. Bradley"). This stadium is also where, on one night in 1991, Mike Powell long-jumped 29 feet, 4 1/4 inches, breaking the record Bob Beamon set in Mexico City at the 1968 Olympics, 29-2 1/2. There is history here. One of the dilemmas, should Tokyo win, is what to do with those stones because the plan for this stadium is to turn it into a fantastic spaceship-looking structure, at a cost of $1.9 billion, to be ready for the 2019 rugby World Cup and the 2020 Games. History and the future, the "sacred haven" and what's next -- they exist right next to each other in jam-packed Tokyo. "The building must be re-born," Takeda said. Here is the formal entry to the stadium. If Tokyo wins, enjoy that view while you can. Because nothing lasts forever. Not even Bob Beamon's long-jump record. The U.S. women's ski team is so deep that three weeks ago coaches had to make a difficult choice about who to leave off the start list for the downhill at the world championships in Schladming, Austria. Ultimately, they decided, reluctantly, that Laurenne Ross would be the one who wouldn't go. So who takes second Saturday in a World Cup downhill at the famed Kandahar course in Garmisch-Partenkirchen, Germany, site of the 2011 worlds? Tina Maze of Slovenia won the race in 1:40.46, adding to her historic season -- she now has 2,024 World Cup points, most ever, more than Austria's Hermann Maier's previous-best 2,000 in 2000. Maze has totally locked up the World Cup overall title and there are still seven races yet to go. Ross finished 39-hundredths back, in 1:40.85. Local girl Maria Höfl-Riesch, the 2011 World Cup overall winner, took third, half a second behind in 1:40.96. Ross became the sixth American woman to finish in a World Cup top-three this season in the downhill or super-G.
Before the start of the 2012-13 season, the U.S. women's speed team, led by coach Chip White, set a goal of landing all six on the podium. Alex Hoedlmoser, the U.S. team's head coach, went up to White after Saturday's racing was done and said, "We did it," adding a moment alter, "This is really promising as we look ahead to Sochi," and the 2014 Winter Games next February. On the tech side, meanwhile, Mikaela Shiffrin has won three World Cup slalom races; Shiffrin also won the slalom in Schladming at the world championships. The race Saturday marked the first top-three World Cup finish of Ross' career. She joins Stacey Cook, Leanne Smith and Alice McKennis as first-time podium finishers. Lindsey Vonn -- who tore up her right knee in the super-G in early February in the first race of the world championships -- has three downhill victories this season; Julia Mancuso has three super-G podium finishes and, as well, a super-G borne at the world championships. Vonn, who obviously has missed the last two downhill races, nonetheless still leads the World Cup downhill standings, by all of one point. Maze is second. There's one race remaining. The race Saturday played out in two different acts. Act one was consumed by fog. It stayed that way through McKennis' run. She started with bib number 12. Entering the final "Tauber Schuss," she crashed -- hard -- and was airlifted by helicopter to a local hospital, where doctors found she broke a bone in her lower right leg. Act two was everything that followed. By the time the race started again, the mountain was splashed in sunshine, the visibility perfect, the racing so much faster. Maze ran 18th, Ross 26th, Höfl-Riesch 20th. Ross' previous best finish had been fourth, in a super-G, two seasons ago. "I just put it all out on the line and I'm psyched," she said. 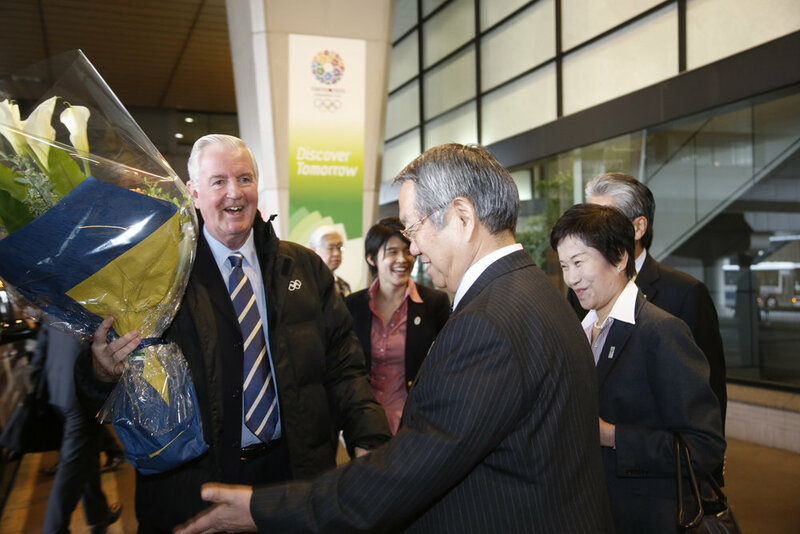 Sir Craig Reedie, an International Olympic Committee vice-president, got the full red-carpet welcome Friday at Tokyo's Narita International Airport. Photographers happily caught Tokyo Gov. Naoki Inose introducing his wife, Yuriko, to Sir Craig. In another shot, Sir Craig was seen bounding along Narita's walkways with a bouquet of welcoming flowers, a perfect tableau to set the stage for the IOC evaluation commission's four-day inspection of Tokyo's plan to host the 2020 Games. And so it begins again, another round of these evaluation visits. The IOC commission visits the other two cities in the 2020 race, Madrid and Istanbul, later this month. Over the years, these inspections have become a defining tenet of Jacques Rogge's tenure as IOC president. In September, however, Rogge's 12 years in office come to a close; voting for his successor, along with balloting for the 2020 bid-city race, will take place at the IOC general assembly in Buenos Aires. The question the shrewd contender to replace Rogge will ask in meetings around the world with fellow members this spring and summer is elemental: does this system do what it's supposed to do? It’s time, in this, a pivotal year for the IOC, for big-picture thinking. The IOC is poised now for a once-in-a-generation turn. The presidential campaign is just starting to take shape. That race is entwined with, among other dynamics, the 2020 bid-city campaign, the policy-making executive board’s recent move to drop wrestling from the 2020 program, a notion that the 70-year-old age-limit now in place for members ought to be reviewed and a persistent feeling among some number of members that IOC staff at headquarters in Lausanne, Switzerland, exerts a disproportionate influence in Olympic affairs. At issue, fundamentally, is the role of the members of the International Olympic Committee. In these first years of the 21st century, what is their mandate? This is the pivot around which the presidential race likely turns, as potential candidates such as Thomas Bach of Germany, Ser Miang Ng of Singapore, Richard Carrion of Puerto Rico and perhaps others, including C.K. Wu of Chinese Taipei, weigh their options. The mainstream press is often replete with stories of how being an IOC member has to be a cushy gig. The reality is that the actual "job" -- being an IOC member is, of course, a volunteer position -- is hugely limited. -- Every other year, members choose a host city for the Games, Summer or Winter. The vote is seven years out. In 2013, members will choose for 2020. -- The year after an edition of the Games, Summer or Winter, they vote for which sports go on the program of the Games -- again, seven years from that vote. -- They elect their fellow members to the policy-making executive board (15 positions) or vice-presidential spots (four). The executive board typically meets in-person four times a year. The rest of the time, that leaves the staff to run the show, and advocates for Rogge's management style would say he and staff have professionalized the IOC in innumerable says. That said, it almost inevitably has led to the persistent feeling of a shift in the balance of power toward headquarters in Lausanne and away from the members themselves. That development now animates the presidential race. Which leads back to the evaluation commission. And, in another example, the executive board's move Feb. 12 to cut wrestling from the 2020 Games. The 50-point reform plan passed in late 1999 in response to the Salt Lake City corruption scandal took away one of the perks of membership, visits to cities bidding for the Games. Was the goal of the ban to keep the members honest? Reality check: if you want, you can meet an IOC member anywhere in the world. Still. The goal was to keep the cities honest. Now: has the IOC achieved what it sought? The answer has to come in three different parts. Has there been another bid-related corruption scandal? No. But has the cost of the bid-city process come down? Hardly. It is now routine for cities to spend $50 million or more on bids -- $75 or $80 million, maybe more, is not uncommon. Bluntly, there is no way, given that accounting systems in different parts of the world vary in transparency, to know how much every single bid cost. Moreover, has the IOC actually gotten what it thought it was buying when it voted? Beijing 2008? It made history, yes. In bidding for the Games, the Chinese fixed the investment at $14 billion. It turned out to be $40 billion, probably more. London 2012? A rousing success on many levels. But, again, a construction and infrastructure budget that ended up way high, at roughly $14 billion. That was nearly four times the estimate provided in London's 2005 bid book. Though the world will be transfixed come September on whether the IOC picks Madrid, Istanbul or Tokyo, the back story is that last February, Rome – one of the world’s great capitals – bowed out of the 2020 race, saying it was too expensive to play. That is a huge warning sign. And the IOC has for several cycles had trouble finding enough qualified Winter Games bids. Annecy, the 2018 French candidate, received only seven votes. Rogge has been a vocal proponent of the system as it is now. With his term ending, however, perhaps the time has come to suggest a review – or at least for a presidential candidate to explore whether, in a broader context, the time is now to somehow more empower the members in the bid-city process. Because, obviously, the underlying principle of that process now is that the members can't be trusted not to take bribes if they go on fact-finding missions. If you were a presidential candidate, would you say that principle empowered your fellow members, or not? To reinstate member visits would certainly involve complex logistical and financial steps. For instance, would the cities pay? Or the IOC? Are these issues, however, at least worth serious discussion? A winning bid is worth billions of dollars; visits by 100 members would run seven figures. There is a compelling argument that’s a worthwhile investment on all sides. The evaluation commission, which itself costs significant money, prepares a report -- most members could not truthfully say they read it, word for word -- and the bid cities get to make presentations, with videos and speeches, to the full IOC. When you ask the members to make a decision on a project worth billions, is that a best-practices method? Reporters are allowed to go on the evaluation visits. They get to read the evaluation report and watch the presentations. Yet the members have votes but reporters don’t. What’s the disconnect there? Not to say that Rio de Janeiro still wouldn't have won in 2009 for 2016 but Chicago figures to have gotten more than 18 votes if there had been visits; to this day, how many members have seen the beauty and potential of the Chicago lakefront? Sochi probably still would have won in 2007 for 2014 -- it had the best story -- but what would the members have thought if they had gone there and seen the palm trees by the Black Sea and then nothing but forest up in the mountains? Moreover, the Sochi project – with capital costs budgeted at roughly $10 billion, in 2006 dollars, in the bid book -- is now north of $50 billion. In Sochi, the Russians were starting from scratch. It's one thing to look at the bid file and see $10 billion, which is course a ton of money; it's quite another to be there, up in the Krasnaya Polyana, in the forbidding geography, and wonder just how much money and manpower it would take to make it into a Winter Olympic site. Sometimes there really just is no substitute for seeing something with your own eyes. As for wrestling – this time around, it was wrestling that got the executive board’s boot. Who's got next? Which Summer Games sport, or sports, will it be then? Unless the system changes with the new president, the “core” is due to be reviewed every four years. That means the next call is after Rio, in 2017. The 25 that are, right now, the “core” – nowhere is it written that come 2017 they will be the core again. What it also underscores is the process: The IOC program commission undertook a study. The executive board, acting on that study, voted on the “core.” It will vote again in May on which sports to present to the floor in September. So what are the members’ choices? Take it or leave it? Or risk raucous debate? Since one memorable session in Mexico City in 2002, such debate has not been the IOC way under the Rogge presidency. No wonder there is already talk that a new president has to find a different way. And one final thing. The 1999 reforms mandated that newer members have to give up their membership at age 70. In the 13-plus years since, what has been learned is that many sports officials don’t even get to be in position to become IOC members until their early 60s. By the time they then learn their way around, the rules say they have to leave. Wouldn’t the smart presidential candidate push to raise that age limit to 75? Indeed, wouldn’t the smart candidate simply be framing a platform all around with the notion of seeking to empower the members as much as possible? Doesn’t that just make sense? Finally -- some straight talk about why the International Olympic Committee moved to kick wrestling out of the Summer Games in 2020, and what to do about it. All you have to do, it seems, is tune in to radio station KCJJ, "The Mighty 1630," in Coralville, Iowa. The Mighty 1630 would be all of 10,000 watts beaming out to Coralville, Iowa City and the rest of eastern Iowa, and earlier this week you could have heard Terry Brands, the associate head coach of the University of Iowa wrestling team and a 2000 Sydney Games bronze medalist in the sport, tell you in plain terms what happened and what needs to be done now. FILA, the sport’s international governing body, was asleep at the switch, he said. The IOC had been sending it signals for years that it "perceives us as different from how we perceive ourselves" but that message "went unheeded," with the result that the IOC executive board moved two weeks ago to remove wrestling from the list of 25 "core" sports on the 2020 Summer Games program. What needs to happen going forward, he said, in the wake of leadership change at the top of FILA -- president Raphael Martinetti, a Swiss businessman, out in favor of acting president Nenad Lalovic of Serbia -- is elemental. It's called lobbying. It's relationship-building. It's what FILA should have been doing all along. All with the aim of getting wrestling included on the list of sports the IOC general assembly can review in September in Buenos Aires. The IOC board will draw up the list at its next meeting, in May in St. Petersburg, Russia. It's unclear how many sports the board will put forward for September review; the current odds favor three, with wrestling competing with the likes of squash, karate, sport climbing and a combined bid from baseball and softball. There's room for just one more sport on the 2020 program -- if, and that's a big if, the IOC decides to include one more sport. The number, including golf and rugby, now stands at 27. By rule, the maximum number for any Summer Games is 28. "If I'm a FILA rep," Brands said, "then I'm going to go out and I'm going to have dinner with people and I'm going to listen to them and I'm going to act like I care. Because I do care. "Because that's what my job is. It's not about acting any more. I mean, are we with FILA because we want to have a status symbol or a resume booster? Or are we with FILA because we actually give a crap about wrestling?" Truly, this is the fundamental question. With some key exceptions, much of the outcry in the United States over the IOC’s move to exclude wrestling from the program core has been – as the saying goes – preaching to the choir. It has been wrestling proponents talking to each other, most acting like the guy on the football team who didn’t see the crackback block coming. For those feeling blindsided, Terry Brands has crystalized your question. It’s all about winning votes. Understand, though, that the IOC plays by its rules. That’s the way it is. That does not – repeat, not – mean the IOC is corrupt or venal. It means there’s a process, and it’s helpful to understand both context and process. Most talk since the IOC action has focused on how wrestling is a sport that is practiced the world over, with proponents noting there are 177 member nations of FILA. But the numbers in the report that formed the basis of the IOC action also tell a different story. The London 2012 Games welcomed 205 national Olympic committees. The wrestling competition included 71, or only 34.6 percent. Does that seem, to use the IOC’s phraseology, “universal”? There are 12 African IOC members. In London, there was one African wrestling medalist. What is the African interest come September in seeing wrestling in the 2020 Games? There are 10 IOC members from South or Latin American nations; their wrestlers won two medals last summer. Same question. Of the 71 nations competing in London, wrestlers from 29 won medals. By far the most medals went to European nations – 12 men and four women. There are currently 101 members of the International Olympic Committee; the IOC is traditionally Eurocentric; 43 members are European. Right now one of the moves within the broader Olympic movement is to establish or grow continental Games; the first European Games are scheduled for 2015. Yet Around the Rings, an Olympic newsletter, reported last week that wrestling officials had inexplicably not returned multiple calls to discuss being included in those 2015 Games. It’s little wonder that Jim Scherr, the former USOC chief executive -- and former executive director of USA Wrestling -- acknowledged in a conference call Thursday with reporters the sport now faces a "major challenge" in regaining its place for 2020 and beyond. At the same time, he said, "It is a tremendous opportunity to make a real and lasting change for the future of the sport." Wrestling, he said, needs to simplify rules, enhance the sport's presentation and create a better media model and sponsorship platform. It also, he said, needs to be a better member of the so-called Olympic family, which goes back to the person-to-person thing that Brands identified, as well as a broader understanding of what works in the IOC and what doesn't. Here, though, is where things can get tricky. It takes relationships. It takes experience. Candidly, it's not certain whether a hurry-up effort -- being pieced together on the fly with the aim of getting a job done by September after a February wake-up call -- is going to be enough. It’s also not clear how some of the published responses in U.S. newspapers are going to play come September. Memories in the IOC can be vivid. The Washington Post published an op-ed by Donald Rumsfeld, who served as U.S. secretary of defense for President George W. Bush, urging the IOC to reconsider, Rumsfeld saying he learned many life lessons as a high school and college wrestler. If the former secretary was trying to win votes – what, exactly, was his strategy? The Los Angeles Times published an op-ed praising the potential of relationship-building after American wrestlers were among those taking part recently in an event in Iran called the World Cup. The article described Americans walking the streets of Tehran “not as people from the ‘Great Satan’ but as comrades in the union of athletes.” Awesome, right? Wrestling is very big in Iran. Last summer in London, Iranian wrestlers won six medals; that was tied for third-best at the 2012 Games, along with Japan and Georgia. Azerbaijan won seven. Russia topped the medals table with 11. Asked at the end of Thursday's call if there might now be plans for a USA vs. Iran match in the works like last year's pre-London Games USA vs. Russia freestyle headliner in Times Square, the current executive director of USA Wrestling, Rich Bender, cautioned that any such notion was "premature" but allowed, "There are some large-scale plans and ideas that can showcase our sport." Certainly, sport can sometimes open doors diplomacy can't. But, again, it’s votes, votes, votes. There aren't any Iranian members of the IOC. Amid any high-fives over the Iranians' seemingly gracious welcome to the Americans, did anyone bother to wonder what would happen if an Iranian wrestler was at the Olympics and, say, drew an Israeli. What then? The Iranians’ ongoing refusal to engage Israeli athletes on the field of play, citing all manner of excuses, has been a contentious point of intolerance for years now. Are the Iranians suddenly good partners for a campaign of purported fraternity and goodwill? Just imagine a match like last year’s, but this time with Iranian wrestlers, and again in New York – home to the second-largest Jewish population in the world. As for Japan -- there is only one Japanese member of the IOC, Tsunekazu Takeda, and he became a member only last year. Moreover, he is the president of the Tokyo 2020 Summer Games bid. How much time and energy does he have in each and every day to devote to Tokyo 2020 -- which would be worth billions of dollars to his country -- and then to wrestling? There are no Azerbaijani nor Georgian members. The United States used to win a lot of medals in wrestling. No more. The Americans won four medals in London, out of 104. That's two percent of the medal total. If you were in business, how much time and energy would you devote to something that was worth two percent of what you did? Even so, it's probably worth it to the U.S. Olympic Committee to do more; chief executive Scott Blackmun and board chairman Larry Probst know full well they are in the relationship business, and for them wrestlers have undeniably proven a vocal constituency. That said, this would seem to be a play the USOC would make in support of or in concert with the Russians, and their three IOC members. Those 11 medals made up 13 percent of the Russians’ 82 total in London, which is why President Vladimir Putin's spokesman, Dmitry Peskov, said last week Russia would work with the IOC at "all possible levels" to keep wrestling in the Games. There's also the strategy that Terry Brands suggested on The Mighty 1630. "I would," he said, "start with prayers." Anchored by Billy Demong, the fan favorite from the Vancouver 2010 Olympics, the U.S. Nordic combined team raced Sunday to a history-making bronze in the relay at the 2013 world championships at Predazzo, Italy. The third-place finish made for the first-ever U.S. team world championships medal in Nordic combined. The best prior world championships result? Fourth, in 1995. Of course, the U.S. men took silver in the relay at the 2010 Vancouver Olympics. The bronze Sunday came as U.S. women -- Kikkan Randall and Jesse Diggins -- won gold in the team sprint at the 2013 worlds. That made for the first world championships gold medal the U.S. cross-country team has won, ever; the only Olympic medal the U.S. cross-country team has won dates to 1976, Bill Koch's silver in the 30-kilometer event. For those who believe third is just two lonely places away from first, Sunday's bronze serves as an important reference beyond its place in history. It gives renewed legitimacy to prospects the U.S. Nordic team might -- might -- be able to recapture the magic of its breakout performance in Vancouver. Candidly, and everyone in the United States associated with a sport like Nordic combined will acknowledge it, as satisfying as a bronze medal at the world championships is, and it is, what matters is the Olympic Games. That's when America pays attention. That's why what happened in Vancouver was so big. Demong won individual gold (on the large hill), Johnny Spillane two silvers (the large and normal hill) and then there was the relay silver. For years and years, Demong, Spillane, Todd Lodwick and Brett Camerota had put in the work; U.S. Ski Team officials had launched a plan for medals in 1996, and never wavered. Vancouver brought the payoff. The night he won gold, Demong proposed to his longtime girlfriend, Katie Koczynski. Then he was chosen to carry the U.S. flag in the closing ceremonies. Heady stuff for a Nordic combined guy, for an athlete from an American program that before Vancouver had never, ever won an Olympic medal of any sort. Now Billy and Katie are the parents of 2-year-old Liam. Now Billy is 32; he'll be 33 next month. Lodwick, who skied Sunday's third leg, is 36; he will be 37 in November. Now, too, the program has seen the emergence of the Fletcher brothers, Taylor and Bryan, who -- like Lodwick and Spillane -- are from Steamboat Springs, Colo. Demong -- originally from the area around Lake Placid, N.Y. -- now calls Park City, Utah, home. Bryan, now 26, was named the FIS Nordic combined athlete of the week at the end of the 2012 season, after his victory at the World Cup finale at Holmenkollen in Oslo, Norway. Taylor, 22, won the same award last month for his fifth- and third-place finishes -- his first career podium -- in Seefeld, Austria. Taylor might well be the fastest skier on the circuit, testament to his own talent and U.S. coach Dave Jarrett's training program, which calls for repeated blocks of intensity workouts. What has been the sticking point -- as the U.S. team builds toward Sochi -- is not the skiing. It has been the jumping. On Sunday, the Americans got a big break. Taylor Fletcher got a wind-based re-start. Essentially, he got a do-over on his jump. His first jump? 79 meters. The second try? 93 meters. Big difference. With that, the Americans started the skiing in fifth, about a minute behind the best-jumping Japanese. Taylor Fletcher skied first, Bryan next. Bryan moved to second early in his leg, then tagged to Lodwick in third, 23.3 seconds behind Austria. Lodwick tagged to Demong with the U.S. a close fourth. Early in his anchor leg, Demong surged to the lead, ahead of Japan, France, Norway and Austria. With under two kilometers to go, he still held the lead, followed by Norway's Magnus Moan and France's Jason Lamy Chappuis. Those two attacked on the final climb. Demong fell back. Lamy Chappuis broke to the finish, crossing four-tenths of a second ahead of Moan. Demong held off Japan's Yusuke Minato and Austria's Mario Stecher; Demong finished 4.2 seconds back of first. "Honestly, going into the last leg I had a goal to just ski a smart race and not lead it all," Demong said. "I ended up leading almost the whole thing. "In the end I was a little unsure if the other guys were really going to be fresh, and coming down the last hill, I’m like, 'Don’t look back, you don’t want to know. Just keep chasing Magnus and Jason.’ So I think it was really a relief to come within five meters of the finish line and just glance and say, 'OK, yeah, we’ve got this.' "
All four guys wore U.S. flag mustaches -- a team-bonding thing. They had agreed Saturday night they would do it, and the mustaches were the talk of the news conferences afterward. Maybe it'll be a trend for Sochi 2014. "We came in this knowing that we were going to be close for the cross country, knowing the jumping had put ourselves in position," Taylor Fletcher said. "We don’t come to this competition to lose so we did our best to fight for the podium and fight for the victory. I give it up to our staff, teammates, coaches and, of course," he said, "the mustache was the deciding factor in this." Kikkan Randall and Jesse Diggins, racing Sunday with quiet confidence, won the team sprint at the 2013 world championships in Val de Fiemme, Italy, the first-ever gold medal for the United States in cross-country skiing. Again, and for emphasis -- the first-ever American world championships gold in cross-country skiing. Randall and Diggins actually won big, by 7.8 seconds over Sweden's Charlotte Kalla and Ida Ingemarsdotter, women -- and good friends -- the Americans trained with over the summer. Finland's Riikka Sarasoja-Lilja and Krista Lahteenmaki finished third, 10.95 seconds back. "It feels incredible," Randall said afterward, adding, "This is something we have looked forward to for a long time. This is my seventh world championships. I've had to spend a lot of time watching awards ceremonies. So we're pretty excited to do it -- in a team event, especially -- and finally get the U.S. on the podium." Randall and Diggins make for an intriguing pairing. Randall is 30, from up in Alaska and, as she said, has been around. The 2014 Sochi Games will be her fourth. She has methodically built her way up to become one of the world's best sprint skiers; last season she won the World Cup sprint title, a first for an American woman. In Sochi, incidentally, the sprint will be run as a freestyle race, which plays to Randall's strength. She took silver in the individual freestyle sprint at the world championships in the Czech Republic in 2009. The team sprint was freestyle on Sunday in Val di Fiemme; in Sochi, it will switch to classic. Diggins, meanwhile, is 21, from Minnesota. She's not awed by any of this big-time stuff. Indeed, in the news conference after the victory, she said of the Swedes, "This is weird. I still have pictures of these guys up on my wall. They probably don't know that." Randall and Diggins made it plain that they were for real when they won Dec. 7 in Quebec City. That victory was the first-ever U.S. World Cup team event win. The Swedes were thought by many to be Sunday's pre-race favorites. The plan, which Randall and Diggins and their coaches set out, was to be aggressively conservative. That is not an oxymoron. Both women have a strong finish -- a strong kick, just like in track and field -- if there's something left in the tank. The trick would be to stay in close contact with the race leaders through the first two legs. Then it would be go time. Diggins skied the third, and decisive, leg. It was here that she broke the Swedes and the Finns -- and, on a steep climb, one of her own poles, too. As luck would have it, a U.S. coach, Erik Flora, sprinted down the track to give Diggins another pole. She didn't even lose momentum. All Randall had to do in that final leg, to control the race, was ski under control. "That was so incredible, just seeing that clean snow in front of me and crossing the line," Randall said. "I tried to be stoic and stand up for a while but my legs were pretty dead. That moment when your teammate comes running out and it starts to sink in that you’re world champions -- it’s incredible." Diggins said, "We both knew that if everything came together just right and we skied really good we had the chance of a medal, but it’s sprint racing, things happen. Your poles come off. People step on your poles. It all came together anyways and that’s a really cool feeling to be able to share with our whole team." Sarah Hendrickson's victory Friday at the ski jumping world championships made for an emotional victory high in the Italian mountains that seemed like something even a Hollywood scriptwriter might not offer up for fear it would seem, well, not real. But it really happened. Hendrickson is just 18. She out-jumped Japan's Sara Takanashi in a thrilling duel to win the 2013 worlds. On the jumps in the narrow Italian valley where her coach grew up. The jumps the coach's father helped build. At the championships the coach's mother was so excited to have here -- except that she passed away, unexpectedly, just a couple weeks ago. So Sarah went out and won the contest -- for herself, of course, and her mom, dad and brother, who were there watching, and the entire U.S. team, cheering her on, and of course, her coach, Paolo Bernardi, who as it happens is one of the world's nicest guys and, obviously, a first-rate coach. Jessica Jerome of the United States finished sixth. Five jumpers, including Jerome, hit jumps of 100 meters or longer, and what was abundantly plain Friday -- this could have been seen two years ago at the world championships in Oslo but for many got lost that day in the fog -- was that women's ski jumping doesn't have to prove anything to anyone any more. It's just one more winter-sports discipline, with depth and talent. The big fight before the Vancouver Games over whether it belongs -- that's yesterday's news. Next February in Sochi, it will make its Olympic debut. What that means is there are already better stories in women's ski jumping than the issue of ski jumping itself. Among them: Sarah Hendrickson. Sara Takanashi. And Paolo Bernardi. Hendrickson's victory makes for the second significant U.S. teen victory in just a few days at a winter world championship. Mikaela Shiffrin, 17, won the slalom title at the alpine world championships last week in Austria. Sarah Hendrickson is from Park City, Utah. She grew up on the 2002 Olympic jumps there. She is the 2012 World Cup season champion. Sara Takanashi is already the 2013 World Cup season winner; she clinched that title last weekend in Slovenia. Bernardi is from Predazzo, Italy. That's the little spot where the ski jumping potion of the Nordic world championships is being held this week -- on the very ramps his dad literally helped construct. Three years ago, at the 2010 Olympics in Vancouver, Bernardi was a ski tech for the U.S. Nordic combined team. What that means, in plain English, is that he waxed skis. That was his job. It happened after Vancouver that he was hired to become the U.S. women's ski jumping coach. He has not only helped develop their ski jump talent, he has developed a culture within the team of trust and confidence. Because Predazzo is home, Predazzo has become something of a second home for the U.S. team. They go there to train. They know the hill. They like the hill. At last year's World Cup, a two-day event, Hendrickson won both days -- and on the second jump on second day, she jumped way out there, 108 meters. Last month, as the women's tour was in Japan, Bernardi's mother, Gina, passed away. He left the tour and -- this is how it is -- some foreign-tour coaches stepped in to help the U.S. athletes. He rejoined the team at the stop in Ljubno, Slovenia. Before her first jump Friday, even though she knew the hill well, Hendrickson would say afterward, "My heart was beating and everything was shaking." Why? Probably because it was the worlds. And because Takanashi had whomped the field in Ljubno and that coming into the worlds she -- Hendrickson -- "definitely had doubts." Then it all settled down and, on her first jump, she rocked it for 106 meters. "The first jump is important for me mentally," Hendrickson said. "If I have a good first jump, I know I can have a good second jump. If I have a hard first jump, sometimes I mentally shut it down, so it was really important for me." On their second jump, both went 103. "I had to stay strong and do my jump regardless of what the results were after the first round," Hendrickson said. With style points, Takanashi finished at 251. Jacqueline Seifriedsberger of Austria took third, with 237.2. "This is hometown for Paolo -- born and raised," Hendrickson said. "His dad built these ski jumps. I've had an amazing relationship for the past two years he's been coaching. To share this with him in his hometown is awesome. No words need to be exchanged. Just hugs and happiness." "When we all went out to celebrate with Sarah, we were pretty much all crying." Jerome said. "I think that as a team we do really, really well together." There's a traditional champagne toast in the U.S. team hotel after a gold medal. At the one late Friday, Paolo Bernardi took note of everything, his dad, his mom, the jumps, what Sarah Hendrickson had done, and then he said it was the most important day of his life. And then he popped the champagne. It happened, really, just like that. Lindsey Vonn, two or so weeks after ripping her right knee up in a gruesome fall at alpine skiing's world championships, said Friday she has no doubt she will be back for the Sochi 2014 Olympics. It's a race against time, one that positions Vonn, the 2010 Vancouver Games downhill champion, winner of 59 World Cup races and four World Cup overall titles, not just as an underdog but as the comeback story of the 2014 Games. She made it plain Friday in a conference call with a group of selected reporters that it's a race she intends -- as usual -- to win. "It all depends on me," she said. "I have to work hard and take my time and do it right. I can guarantee I will do that." Vonn, 28, tore the anterior cruciate and medial collateral ligaments and broke a lower leg bone during the super-G, the first race run at the 2013 worlds in Schladming, Austria. She was critical Friday of race organizers. Fog, snow and clouds had made course conditions extraordinarily variable the day of Feb. 5, leaving athletes, coaches and staff unsettled for hours, wondering, obviously, was the race going to be run, or not? Finally, the race was a go -- but, as Vonn noted, she had no idea what the snow itself was going to be like. Instead of being packed icy-hard the way it should be, it was "too soft," she said, "broken down," and when she flew too far off a jump, she hit a patch of loose snow, her right knee buckled and -- that was that. As she was lying there in the snow, in pain, she recounted Friday, she told Alex Hoedlmoser, the U.S. women's alpine head coach, "They should stop the race right there." They did not. Ultimately, however, the race was delayed 14 times due to the weather and called after 36 skiers. Tina Maze of Slovenia won, with Lara Gut of Switzerland second and American Julia Mancuso third. Vonn flew back to the United States and, on Feb. 10, underwent surgery, performed at the Vail Valley Surgery Center by Dr. William Sterett. It went, she said as expected -- the major issue the ACL. The MCL and bone break are, by comparison, relatively minor concerns. If all goes well, Vonn added, she expects to be back on skis by November. November? With the Olympics in February? Perhaps, she said, a little sooner. Then again, maybe a little later. "I'm not extremely concerned when I'm going to be back. I just want to make sure that when I do get back my knee is 100 percent. It doesn't take a lot of training for me to be ready to race again." She noted that knee injuries are something of a fact of life in alpine skiing and that she has taken comfort in seeing others -- in particular her very good friend, Germany's Maria Höfl-Riesch, winner of two golds in Vancouver, the 2011 World Cup season overall champion -- come back from knee injuries. "She's totally motivated, and I also know from my own [experience] that it's not so easy after injury to get full gas again. But I'm sure Lindsey's so strong she can get this feeling and the risk back pretty soon. Maybe at the beginning the first time on skis it will be difficult for her, too. But not for a long time." Picabo Street, one of Vonn's childhood idols, busted up her knee in December 1996, then came back to win the super-G at the Nagano Games in February 1998. So, absolutely, it can be done. "Picabo is definitely a great example of that," Lindsey Vonn said Friday. "As I said, I have no doubt I will be back and be able to ski the same if not better than I did before."